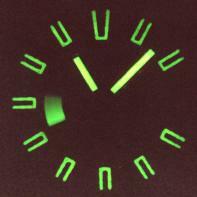 Here are some luminous dials. The photos were taken in a very dark room, with long exposures, about 4 seconds. 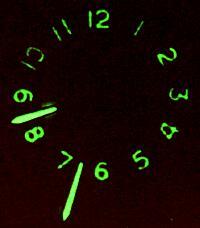 A lot can be said about the materials used to make dials luminescent. 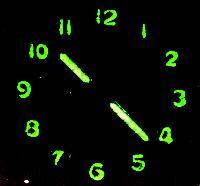 I do know that most of my older watches with luminous paint no longer glow. Sometimes only one hand will work, or half the numbers, or hands but not numbers, etc. 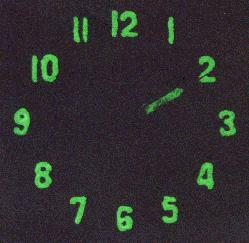 Many substances had been used to get watch dials to behave like this; not everything was radium. I like the images with moving second hand blur, like the one at lower right. The one at lower left was barely luminescent, and the image was barely visible. In order to see it, I had to crank up the gain on the scanned image and it looks grainy and strange. Here is my modern quartz Swatch watch, proving that not all my watches are dinosaurs. The Swatch people named it 'Irony.' Maybe they thought it was ironic that the Swiss industry was rescued by a plastic quartz watch. Moving second hand blur at the 6. Below left, is a Swatch, quartz watch. Unbreakable, useful for the beach, biking, etc. This one shines bright, lights up the whole room. 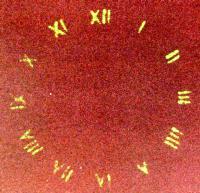 Rectangle box at 3 o'clock is surrounding the date. I don't know why they made the box glow, you still can't see the date. 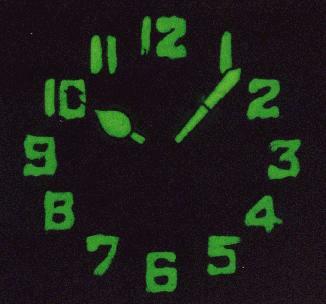 The four circles at 6 o'clock are the moving second hand, showing the characteristic one-tick-per-second feature of quartz watches. 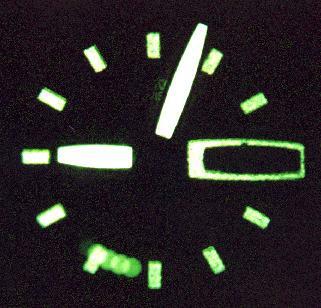 Most vintage mechanical watches tick 5 times per second (five 'half-cycles' of the escapement), though there are 'high-beat' mechanisms with more frequent ticks, and some 'low-quality' ones have a lower beat frequency. 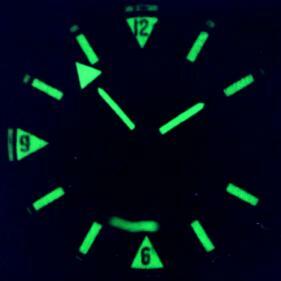 See some beautifully strange images of the luminous material on a watch hand, rendered by the electron microscope...click link.